I love trees and have always wanted to live in a tree house – with certain amenities like a bathroom, microwave and Internet. I’d be fine with the light of my computer, iPhone and lanterns. In fact, I’d make a good forest ranger, living in the mountains, keeping fire watch, ever on the alert for pyromaniacs and lightning strikes, big bears and wild cats. This profession especially appealed to me while working in crowded and cutthroat cubicle land. When I played in trees and tree houses as a kid, watching for fires was the last thing on my 10-year-old mind. Playing with fire was more like it. My girlfriends and I disappeared into the woods after school and climbed up the big oak tree to the shack it held in its branches. The tree and its wooden treasure were on the property belonging to three brothers who went to our school. They were close in age, half French and half English as were many of my friends and neighbors in Montreal. The oldest of the three brothers was a bully, the next was a friendly clown and the youngest, our age, was a heart-breaker. We were most afraid of the bully, so after we removed the “No Girls” sign covering the miniature door and stepped in, at least one of us kept nervous watch. We only stayed long enough to paw through a pile in the corner and find what we needed – strike a big-bulbed match, light a cigarette, take a few woozy drags, and rifle through magazines hoping to find naked people, having grown bored with National Geographic. We were disappointed. Cars and sports. We were never caught, but a big part of the excitement was anticipating the possibility. Who would chase us around, who would joke, and who would try to kiss us? One afternoon we heard voices below and looked out to survey. It was our younger sisters! All four of them threatening to tell if we didn’t let them come up. We didn’t. We always scurried down and left quickly but lingered in our minds, wishing we had our own tree house. I think we asked our fathers and were told it was dangerous or illegal. Funny how they had this mono vision photo in their minds of “women’s place,” aprons, frilly dresses and manners and girls being protected and there we were outside in all our free hours, wandering for miles, finding hobo camps, crawling out over ponds on massive tree branches, hijacking rowboats, outrunning the security guards and police and weirdo who waved his wiener. “Keep them safe” was the motto, but the reality was don’t think of them at all. While we may not have been directed to the soccer field and cheered on, we were left to define ourselves. We tried more than once to erect our own forts, sticking to ground level, pulling bushes around us, but they were never as, well, uplifting or exciting as elevated hideaways with views. And they were easy to smash down as we’d soon discover. In those days, dogs ran all around the neighborhood and a few East Coast hurricanes traveled up the St. Lawrence lashing their tail ends over Montreal, which is an island in the river. 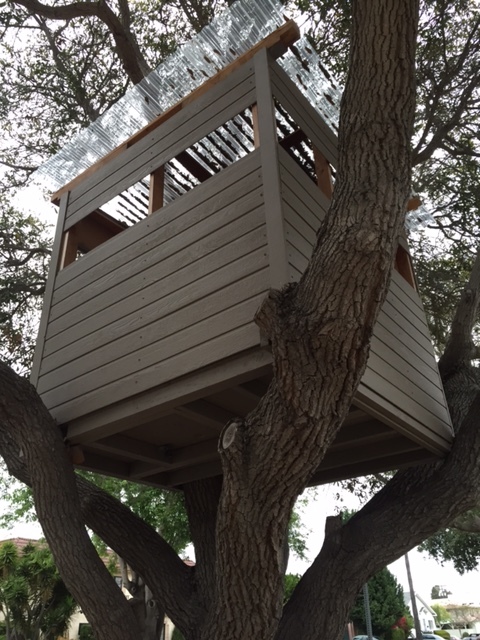 Today when I see little tree houses in back or front yards, I wonder who plays in them. Boys and girls, sure, but what kind of adventures do they have? Pre-fabricated like the tiny wood houses? Do they bring in their cell phones and computers? Do the parents stake out nearby? Keep careful watch from across the yard? From their tree-level windows? Keep careful Neighborhood Watch on us all as we walk and drive by? Are they watching me snap these photos of their tree house? Don’t worry, I mean no harm, I’m not a wild dog or howling wind. Just a quiet observer. Listening for the lost voices. We did sneak up there once. We worried about the bully and our older sisters!